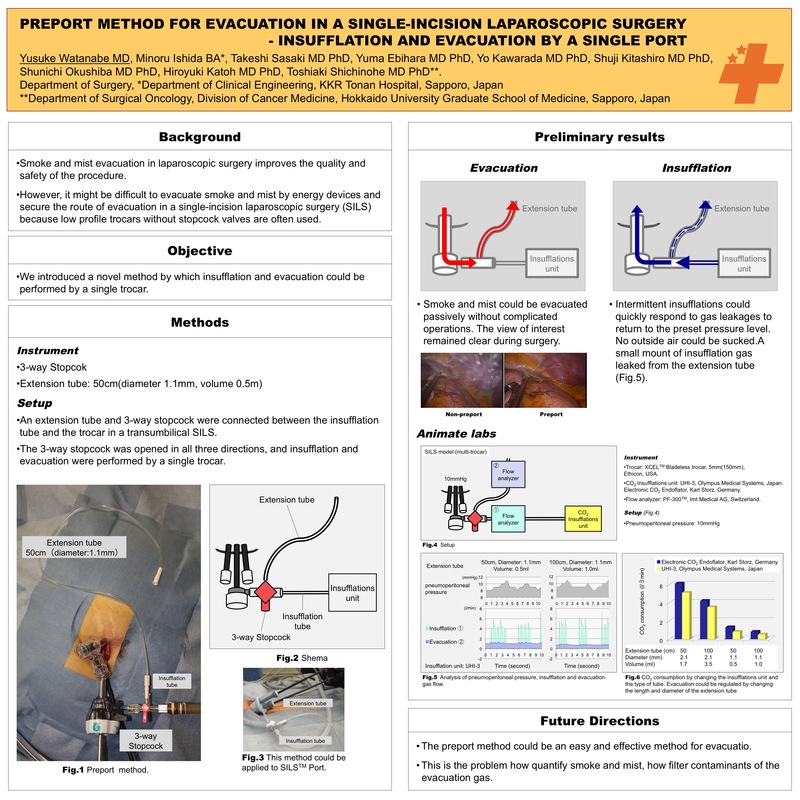 Objective:Smoke and mist evacuation in laparoscopic sugery improves the quality and safety of the procedure. However, it might be difficult to evacuate smoke and mist by energy devices and secure the route of evacuation in a single-incision laparoscopic surgery (SILS) because trocars without stopcock valves are often used. We developed a new method by which insufflation and evacuation could be performed by a single trocar. Methods:An extension tube and 3-way stopcock were connected between the insufflation tube and the trocar in a transumbilical SILS. The 3-way stopcock was opened in all three directions, and insufflation and evacuation were performed by a single trocar. Preliminary results:Smoke and mist could be evacuated continuously without the use of simultaneously linked energy devices. The view of interest remained clear during surgery. Evacuation could be regulated by changing the length and diameter of the extension tube. Intermittent insufflations could quickly respond to gas leakages to return to the preset pressure level. Consumption of carbon dioxide could be reduced compared with that in the case of a simultaneous evacuation system. Conclusion:The preport method could be an easy and effective method for evacuation in a SILS.